Samgak-gimbap is a triangular shaped gimbap which is designed to keep the seaweed fresh by putting it between 2 thin sheets of plastic. So you can eat it hours later, and it will still be crispy. It was invented by a Japanese company. I think whoever thought of this was pretty clever! To make this, you will have to buy seaweed (gim) that was made specially for samgak-gimbap. You should also get a mold for making the triangle shape, but if you can’t get one, watch the video to see how to do it without it, just using plastic wrap. In my recipe I’m going to show you 2 kinds of filling: kimchi and tuna, but you can use your own favorite ingredients to make delicious filling. Cooked rice (about 4 cups), vinegar, white sugar, salt, seaweed for samgak-gimbap, a can of tuna, soy sauce, garlic, sesame oil, roasted sesame seeds, black ground pepper, kimchi, and hot pepper paste. Mix 1 tbs vinegar, 2 ts of white sugar, ¼ ts of salt in a small bowl until the mixture of liquid looks clear. In a large bowl, put 4-5 cups of fresh made warm rice and pour the clear liquid into the rice and mix it and cool down. Open a can of tuna and squeeze out the water through a cheesecloth. In a heated pan, put 1 ts vegetable oil. Add 1 clove of minced garlic, the tuna, 2 ts of soy sauce, and 2 ts of brown sugar into the pan and stir it for a few minutes. Turn the heat off and add 1 ts sesame oil, 1 ts roasted sesame seeds, and ¼ ts of black ground pepper. Chop ¼ cup kimchi and put it in a small bowl. Add 1 ts of hot pepper paste, 1 ts of sesame oil, and 1 ts of roasted sesame seeds to the kimchi and mix it up. Fill the mold about 2/3 full with cooked rice. Place your filling in the center. Top up the mold with rice, put on the lid, and press it down. Take out a piece of gim from the package. Don’t remove the plastic wrap, we need this! Look for the numbers on the sheet. The numbers side of the sheet goes down, and #1 should be pointing away from you. Take the lid off your mold, and place it face down on your sheet. The tip of the triangle should be pointing away from you, towards #1. Let the rice packet gently slide out on to the sheet. When you’re ready to eat it, look for #1 on the side of the packet. Pull that tab and the plastic will peel off. Gently remove #2 and then #3, putting the gim back into place each time. Take a bite. Crispy, isn’t it? Posted on Saturday, June 13th, 2009 at 6:40 pm. Last updated on October 5, 2014. Posted March 19th, 2017 at 9:19 am | Log in to reply. Hi Maangchi! I love Korean cooking and I just stumbled upon your cookbook and website. Love love love your recipes and video instructions! So easy to follow. This is my first time making samgak and it was very successful.Thank you and I look forward to trying your other recipes. ❤️ Keep cooking! Posted March 19th, 2017 at 11:33 pm | Log in to reply. Wow, they look gorgeous! Congratulations! Posted September 7th, 2016 at 9:03 pm | Log in to reply. If you don’t have the plastic triangle, how about making the triangular shape by bending sturdy cardboard into a triangle and the covering the cardboard with waxed paper, so rice wouldn’t stick. Just a thought. Posted September 30th, 2014 at 3:48 pm | Log in to reply. I made this for my kids and they love it and now they make it themselves. I even made it with ground beef, but using a bulgogi marinade and it was fantastic! Posted October 1st, 2014 at 8:41 pm | Log in to reply. yes, bulgogi filling will be very tasty. “they love it and now they make it themselves.” That’s awesome! Posted February 28th, 2013 at 6:54 pm | Log in to reply. Dear Maangchi, I really really loved this recipe! Posted November 18th, 2012 at 8:34 pm | Log in to reply. So… what do you eat the triangles with? Soup? Posted November 16th, 2012 at 12:13 pm | Log in to reply. 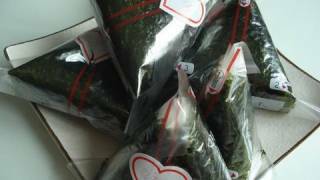 Hello, this food is great but where to purchase (on internet) the seaweed wrapped. I would like to purchase big quantiy. Anyone can help me ? Thank you ! Posted February 21st, 2013 at 10:02 pm | Log in to reply. Amazon.com will have both mold and seaweed. Look under onigiri. Posted September 1st, 2012 at 3:42 am | Log in to reply. hi i wanna try and make this dish but im from brunei so is there any place you can suggest me to buy find sangak kimbab seaweed or the wrappers and mold? Posted September 1st, 2012 at 11:03 am | Log in to reply. Posted September 1st, 2012 at 10:10 pm | Log in to reply. Posted December 30th, 2011 at 8:02 pm | Log in to reply. This recipe is simple and healthy! Posted September 1st, 2012 at 11:04 am | Log in to reply. Posted November 7th, 2011 at 1:52 am | Log in to reply. How can I store these overnight because I want to bring them tomorrow to lunch for school. So I can’t wake up to make them. Also, are there other filling recipes instead of tuna and kimchi? Posted July 3rd, 2011 at 2:51 pm | Log in to reply. 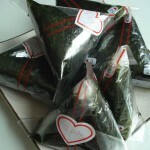 The place to buy seaweed wrap (nori) in Toronto is 865 yorkmills rd and the place is called Galleria. 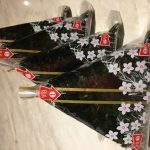 50 pcs seaweed wrap(nori) costs $9.99 canadian dolalr. Posted July 3rd, 2011 at 2:49 pm | Log in to reply. Posted April 21st, 2011 at 11:47 am | Log in to reply. I love this recipe! It’s one of my favorite things to pack for lunch. I was wondering if you had any other ideas for spicy fillings (besides the kimchi). I want to try more fillings but can’t think of any myself. Posted April 22nd, 2011 at 10:52 am | Log in to reply. ooh, u love spicy food! Use hot pepper paste then. When you stir-fry tuna, replace soy sauce with hot pepper paste. You can invent your own filling. Posted April 22nd, 2011 at 9:08 pm | Log in to reply. This recipe was originally posted on June 13, 2009 at 6:40 pm by Maangchi. It was last updated on October 5, 2014. The video was watched 606,308 times on YouTube & has 5,926 likes!